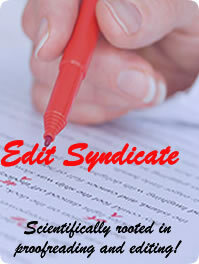 Edit Syndicate is a well structured editing firm that helps researchers and writers to increase the possibility of publishing their articles and books with reputable journals and book publishers. We are your online partner for interdisciplinary English language editing, proofreading, formatting, design and development; and publication support services. Since most articles and books sent for publication in scientific journals and book publishers are often rejected by reviewers and editors because of incorrect English language expressions, it is always important to have a fresh pair of eyes that are knowledgeable in your field of study to read-through your manuscript or book, once you have finished the initial writing process. Articles, both scientific and non-scientific are required to meet a particular standard for publication and information dissemination and this can not be done without a proper language structure. Many great ideas and findings have not been brought to limelight as a result of this problem, hence Edit Syndicate is here to help bridge these lapses in language structure, grammatical errors, syntax problems, wrong punctuation and lots of other mistakes. To provide timely and reliable services of the highest quality in English Language proofreading and editing. To offer comprehensive manuscript and book editing services that inserts the appropriate scientific vocabulary, needed to describe scientific findings and non-scientific reports. Professionalism, Authors' satisfaction, Corporate commitment, Value creation, Strict adherence to internationally accepted proofreading ethics.